Schomacker & Co. piano, originally owned by John and Elizabeth Catherine (Cookus) Show [also Shau]. John Henry Schomacker learned his craft in Vienna and was an accomplished piano maker when he immigrated to the United States and settled in Philadelphia in 1837. He worked with other top piano makers in the city and in 1855 established a factory at Eleventh and Catherine Streets. Henry C. Schomacker, John Henry’s son, took piano making apprenticeships in Germany and returned to the United State to join his father’s business. The company eventually became H. C. Schomacker; in 1861, H. W. Gray became associated with the firm and in 1864 the principals formed the stock company Schomacker Piano Forte Manufacturing Company. Operations continued at Schomacker’s original factory on Eleventh Street in Philadelphia where the Entler Museum’s piano was made. Schomacker pianos won medals at the 1853 World’s Fair in New York City and at the International Centennial Exhibition, 1876, in Philadelphia. The 1876 catalog reprinted a number of testimonials from composers, famous pianists, instructors, and politicians, including President Ulysses S. Grant. An extensive list of references contains the names Thomas L. Durnell and E. S. Wheeler, both of Shepherdstown, WV. 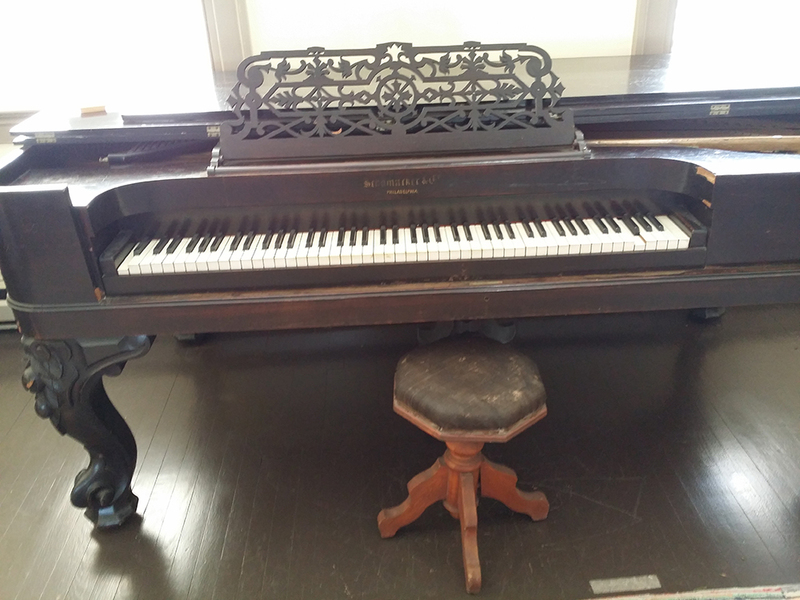 The piano was originally owned by John Henry Show (Schau), born 1841 in Shepherdstown and his wife Elizabeth Catherine Cookus (Aunt Betsy) born 1845 also in Shepherdstown. They resided on German Street.